Hello to anyone still reading my blog! I thank you for your patience! I am finally getting a blog post up about one of the bags I have been making recently! Due to my getting side tracked reading some fantastic blogs tonight (again!! ), I am having to keep my blog post short and to the point. The point is just this bag. Isn't it lovely? To all the recyclers out there... this bag in its entirety is made from recycled/ vintage goods. (oops, except interfacing). The main fabric is a interior fabric swatch I found one day and the flap is a vintage embroidered doily found while op-shopping. 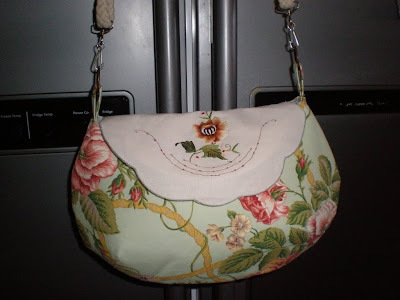 The lining is some pretty floral fabric scrap picked up from a garage sale awhile ago, while the bag handle was a great vintage find and finishes off the bag quite nicely. Cheers for now. Will be back soon with pics of another bag. Plus some tea towels I appliqued and room shoes I made for a friend. I've got to take the photos first but the skies are grey, grey and more grey!!! Too cute, and practical, too. Welcome back! I love your bag the fabrics are so pretty and you did a wonderful job. So great to see you back. This back is terrific, really love how you have used the doily. Oh Kylie, I was just thinking of you the other day and was going to drop you a note to see if you were okay...so nice to see you posting again! 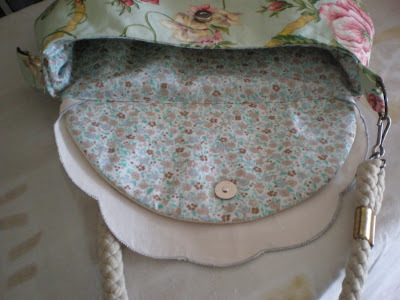 I LOVE, LOVE, LOVE your bag...it's absolutely fabulous and all of those re-purposed pieces work so nicely together. Great job! Hi stranger! Very happy seeing your post in my Reader. Your bag looks gorgeous. 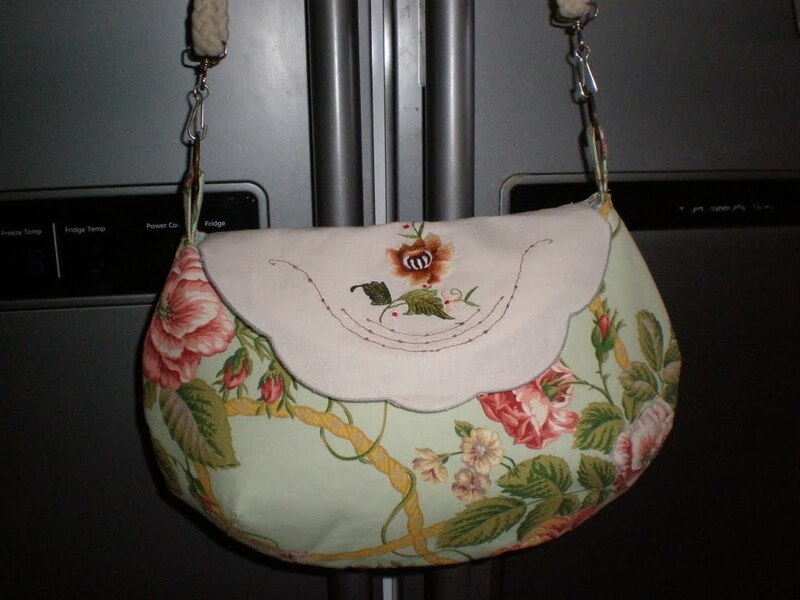 I love the floral fabric that you used for the exterior of the bag. I am a sucker for a great floral. It's gorgeous, Kylie! 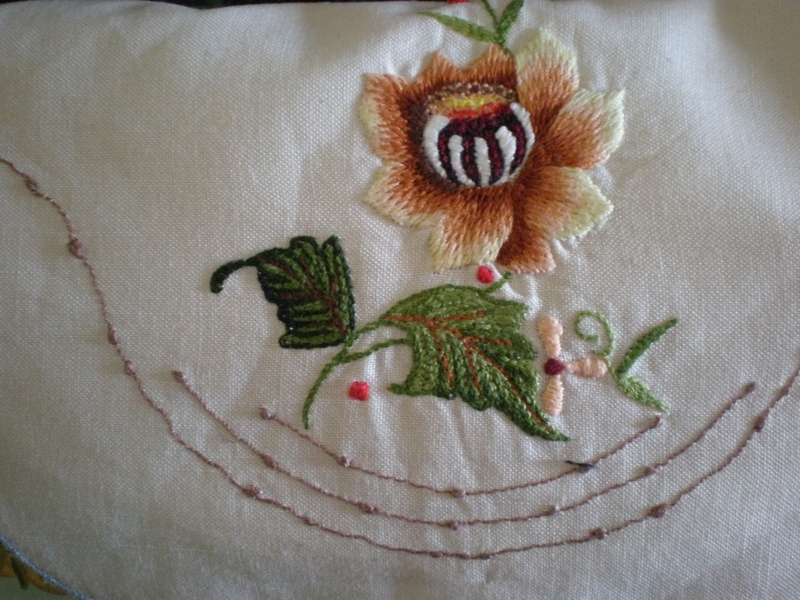 I love the embroidered flap! I like the scalloped flap. It's very antique-like. 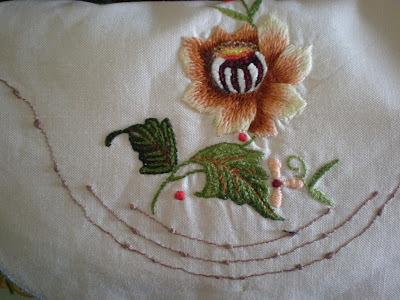 I'd love to work with old fabric with embroidery but in Singapore it's really hard to find any. Glad to see you're back blogging and making stuff.